Camper Trailer Garden Flag -Home is Where We Park It Camper Trailer Garden Flag -Is It Wine O'Clock Yet? Beautiful and upscale Wine O'Clock Garden Flag allows you to showcase your home and decorate your yard in a beautiful, upscale fashion. 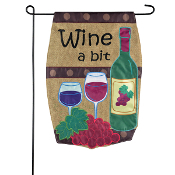 Beautiful and upscale Wine O'Clock Garden Flag allows you to showcase your home and decorate your yard in a beautiful, upscale fashion. 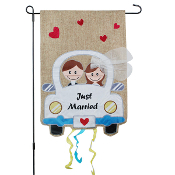 This Campfire Couple Garden Satin Flag is perfect for Summer. Size: 18" x 0.1" x 12.5:. Flag pole is sold separately. These exclusive pieces are made of lightweight, durable linen fabric that is designed to withstand all weather conditions. Flag creation process involves combining pieces of fade-resistant fabric with tight, detailed stitching in order to create a dimensional effect. One of our most popular flag designs, this house flag reads "Wine a Bit, You'll feel better" with a burgundy color and embroidered grapes and leaves. Fade and weather resistant. Honor your favorite pet with this quirky garden flag. Made of durable, medium-weight polyburlap; Weatherproof and fade resistant fabric will not fray after continued use. Measures approximately 12.5 x 18 inches. Features sleeve at top that fits standard flagpoles or stands, sold separately. These exclusive pieces are made of lightweight, durable linen fabric that is designed to withstand all weather conditions. Flag creation process involves combining pieces of fade-resistant fabric with tight, detailed stitching in order to create a dimensional effect. 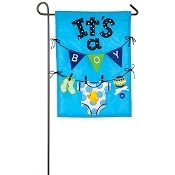 Welcome home your new bundle of joy with this adorable It's A Boy Garden Flag. Weatherproof and fade resistant fabric illuminates in the sunlight. Features sleeve at top that fits standard flagpoles or stands, sold separately. 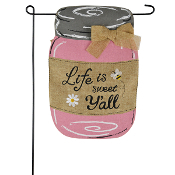 Measures approximately 12.5 x 18 x 0.19 inches. 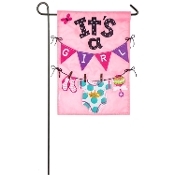 Welcome home your new bundle of joy with this adorable It's A Girl Garden Flag. Weatherproof and fade resistant fabric illuminates in the sunlight. Features sleeve at top that fits standard flagpoles or stands, sold separately. Measures approximately 12.5 x 18 x 0.19 inches. These exclusive pieces are made of lightweight, durable linen fabric that is designed to withstand all weather conditions. Flag creation process involves combining pieces of fade-resistant fabric with tight, detailed stitching in order to create a dimensional effect. This Suede Reflections flag is made of medium-weight, polyester suede that provides a soft and durable texture. The high quality poly-suede is weatherproof and will not fray or fade with continued outdoor use. Evergreen Our Neck of the Woods flag featuring intricate details, captivating embellishments, and timeless touche of stylish charm. Fade-resistant fabric with tight, detailed stitching to create a mosaic effect. The soft yet heavyweight material illuminates beautifully in sunlight. What better welcome than with this Evergreen Proceed To Party House Flag. Double-sided so it reads correctly on both sides with applique technique layering. 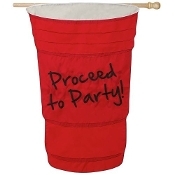 This red party cup house flag is approximately 28" x 44" in size. Material is fade and weather resistant. Flag pole is not included. Show your support for those in Blue with this flag. The soft, yet heavy-weight material illuminates in the sunlight, making any of our applique flags a wonderful addition to your home or garden. All flags also feature an insertion sleeve at top for use with any standard flagpole, sold separately. Great way of letting all know about your happy place is with This is My Happy Place flage made of durable, 310 denier nylon fabric. Weatherproof and fade resistant fabric illuminates in the sunlight. 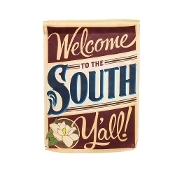 Measures approximately 12.5" x 18". Flags are the greeting card of your home! Decorate your garden space with a touch of beauty and personality while welcoming the season with this vibrant and eye catching flag. Crafted from high quality fabric that will withstand the weather. 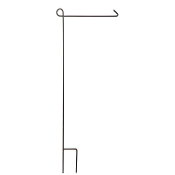 A 1 piece standard garden size flag pole. Stands with an h-stake for use in the garden. Pair with a garden stand base to use on patio, concrete, floor and more. Size: 17.5" x 0.5" x 44". Beautiful and upscale Wine O'Clock Garden Flag allows you to showcase your home and decorate your yard in a beautiful, upscale fashion. Beautiful and upscale Wine O'Clock Garden Flag allows you to showcase your home and decorate your yard in a beautiful, upscale fashion. Tesla would be proud! These LED lighted garden stakes from Giftcraft are sure to impress! 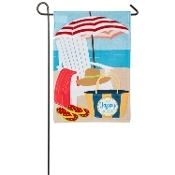 This Livin the Life Garden Applique Flag is perfect for Summer. Size: 18" x 0.25" x 12.5". Fade and weather resistant. Flag pole is sold separately. Weather and fade resistant. 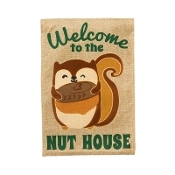 Flag is double-sided polyester burlap indoor and outdoor flag with fall design embellished with Flock Squirrel. Fits garden size flag pole, not included. This Nuthouse Garden Suede Flag is perfect for Fall Harvest. Flag pole is sold separately. Size: 12.5" x 0.15" x 18". Fade and weather resistant. 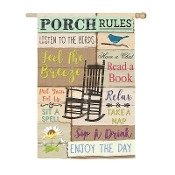 This Porch Rules House Suede Flag is perfect for Summer. Fade and weather resistant. Flag pole is sold separately. This Summer Bicycle Garden Burlap Flag is perfect for Summer. Size: 18" 0.2" x 12.5". Flag pole is sold separately. Designed by Diane Kater, this teal blue flag features two bubbly champagne glasses clicking together and tied with a swirl. Perfect for weddings. Size: 12.5" x 0.04" x 18". 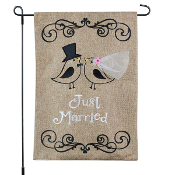 This wedding garden size flag features a wedding dress and tuxedo with pink border and blue background. Reads "Congratulations". Size: 12.5" x 0.04" x 18". Fade and weather resistant. 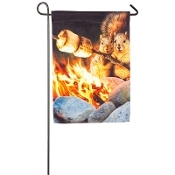 This flag is perfect for campers, hikers, and adventurers. Reads "Welcome to our Firepit" and features a firepit, (felt) marshmallow roasting sticks, and a twig border. Size: 12.5" x 18" x 0.15". Fade and weather resistant. Stock up on our most-popular burgundy red wine-theme flag. 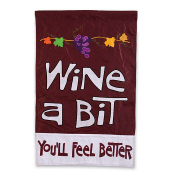 This garden sized applique flag is inscripted with 'Wine-a-Bit, You'll Feel Better' bordered with a line of grapes and grape leaves. Size: 12.5" x 0.1" x 18". Fade and weather resistant. 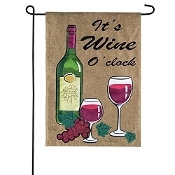 Beautiful and upscale Wine O'Clock Garden Flag allows you to showcase your home and decorate your yard in a beautiful, upscale fashion. Sunset Vista Designs Humming Bird Ornamental Garden Stake Rv Spinner Garden Stake, 42"